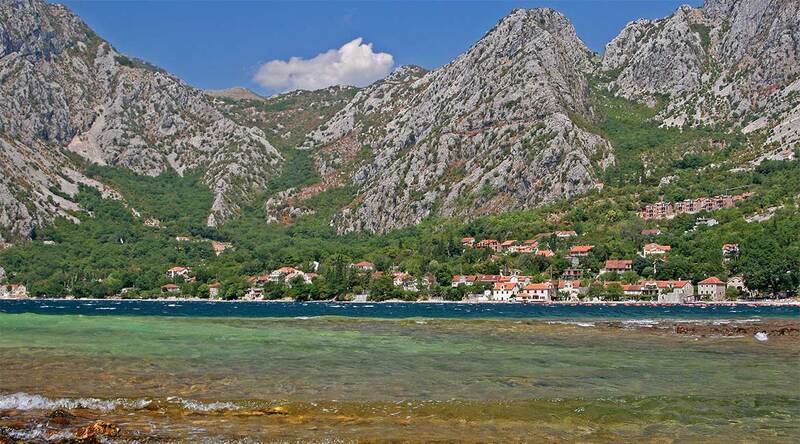 This village is located on the north of Kotor, river Ljuta separates it from Dobrota. This is a traditional maritime and fishing village. In the past, this village was the birth place of many famous captains and it had a fleet of 28 ships. Hotel Casa del Mare – Amfora – This property is 1 minute walk from the beach. Hotel Amfora, situated on the edge of the Boka Kotorska, offers suites with balconies featuring picturesque views over the water and free Wi-Fi. It benefits from a small private beach. Guests can enjoy a sauna, a hot tub and massage facilities at the hotel. The surrounding area offers many leisure activities including hiking and fishing. All of the air-conditioned rooms at Amfora Hotel come with cable TV and a minibar. The sights of Kotor, including St Tryphon Cathedral, the Maritime Museum and the Church of Saint Luke are within 8 km from Amfora. The Hotel’s restaurant serves fish specialities and features live piano music. Home-made ice cream, cocktails and snacks are available from the Beach Café Bar. Facilities : Beachfront, Private beach area, Balcony, Terrace, Free parking, Free Wi-Fi, Pets allowed, Hot tub/jacuzzi, Massage (Additional charge), Spa and wellness centre, Sauna, Bicycle rental (additional charge), Fishing (Additional charge), Restaurant, Minibar, Breakfast in the room, Bar, 24-hour front desk, Laundry (Additional charge), Airport shuttle (additional charge).